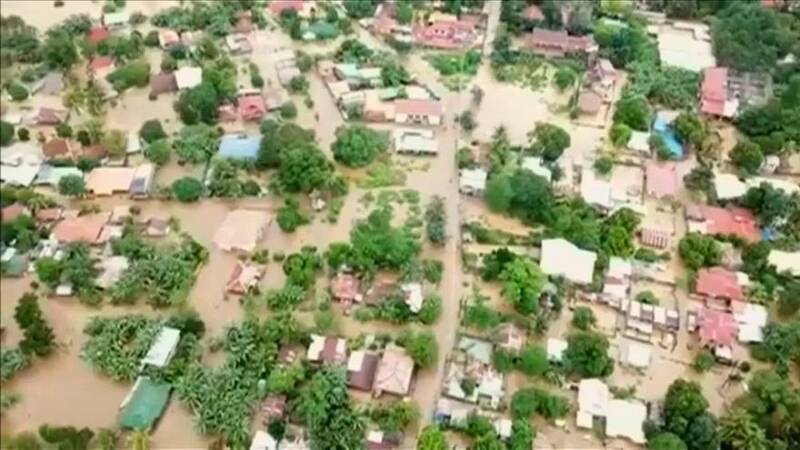 More than 180 people have been killed and dozens are missing after after a tropical storm swept through the southern Philippines. Storm Tembin triggered mudslides and flooding to parts of Mindanao island. Emergency workers, soldiers, police and volunteers have been digging through mud to try and search for survivors. The towns of Tubod and Piagapo, were badly hit with a number of homes buried by boulders. Thousands of people have been moved to emergency shelters or are stranded at air and sea ports. With winds of up to 80km/h (50 mph) Tembin started lashing Mindanao on Friday, with a state of emergency declared in some parts. Power cuts and loss of communication lines have hampered rescue efforts. Around 20 typhoons a year batter the Philippines, and those that are affected most by the destruction are usually the poorest communities of the Southeast Asian country. The region is still recovering from Typhoon Haiyan which in 2013 killed nearly 8,000 people and left 200,000 families homeless.